On March 22, 2006, Azerbaijan's President Ilham Aliyev visited the Zykh construction yard, where the Shah Deniz TPG 500 offshore platform and associated seabed foundations have been built and assembled. The President toured the site and met representatives of the management and staff to review the status of activities prior to the platform sail away in April. The visit was hosted by Phil Home, BP's Vice-President Commercial, and Mike Skitmore, BP's Vice-President for Shah Deniz. The Zykh construction site is a SOCAR-owned facility extensively upgraded by BP on behalf of the Shah Deniz partnership. Today it is a very high quality yard with excellent quayside, workshop and office facilities. The yard is operated on behalf of the Shah Deniz partnership by Technip Maritime Offshore Limited (TMOL), a subsidiary of Technip, the Paris-based petrochemical engineering company, which is the partnership's platform construction contractor. At peak construction activities at Zykh employed approximately 3,500 people of which more than 80 percent were Azerbaijani nationals. Prior to sail away, the yard completed more than 13 million man hours without a lost-time accident. The project at Zykh has also been completed on schedule, despite how complex and difficult TPG-500 has been to build. In addition, the project also utilized the services of some 257 local companies for provision of equipment, material and other services. The Shah Deniz TPG-500 platform is a large jack-up comprising drilling, production and accommodation for 120 personnel. It is a unique facility for the Caspian. The entire platform was completely assembled at the Zykh construction yard. Only two other platforms of this type have ever been built, both of which are presently operating in the North Sea in the UK. 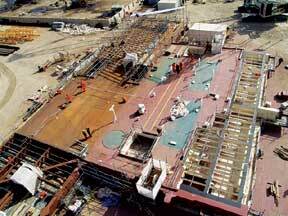 The three legs for the platform and its huge and complex foundation structures were built entirely in the Zykh 3 area of the yard and the whole platform has been assembled at the quayside of Zykh 4. The entire facility weighs approximately 32,000 tons. All systems on the platform were tested and commissioned prior to sail away from Zykh. The platform's drilling facilities are capable of drilling wells of more than 7 km in length and with an outreach of more than 3 km, while its production facilities are capable of processing approximately 1 billion cubic feet (28.5 million cm) of gas and 60 thousand barrels ( 8000 tons) of condensate per day. Gas and condensate from the field will be transported via sub sea pipelines to the Sangachal terminal. The TPG500 will be deployed in the Shah Deniz gas-condensate field in the Caspian Sea, approximately 100 km to the south of Baku. Delivery of First Gas to Turkey, the primary sales market for the Shah Deniz project, is expected before the winter of 2006. BTC linefill has progressed smoothly since the beginning of 2006. On January 4, oil reached the Intermediate Pigging Station No 2 (IPT2) near Kars, Turkey, which is the highest altitude facility along the entire BTC line. From IPT2, oil then headed for Pump Station No2 in Turkey (PT2) where it stopped until the next section of the pipeline was tested and commissioned. Line fill from PT2 to Pump Station 3 (PT3) in Turkey started on March 13th. With oil being pumped at a rate of 175,000 barrels per day, the oil reached PT3 on March 19. 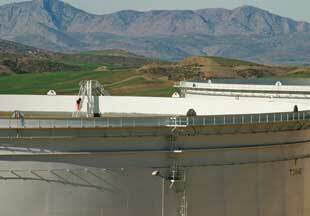 The total volume of the oil already pumped into the pipeline is more than 6 million barrels. A rigorous cycle of testing and commissioning of the remaining sections continue to ensure the integrity and safety of each section of the pipeline prior to introducing oil. The next BTC linefill to Pump Station 4 in Turkey (PT4) is scheduled for the first half of April. The line-fill started up from the Sangachal Terminal in Azerbaijan in May 2005, in August 2005, oil reached the Azerbaijan-Georgian border and in November, it crossed the Georgian-Turkish border. The first tanker out of Ceyhan is planned for the spring of 2006. A total of 10 million barrels of crude oil is required to fill the 1,768 km long line running from the Sangachal Terminal near Baku via Georgia to the Ceyhan Terminal on the Mediterranean coast of Turkey. 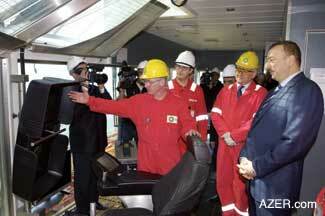 The oil comes from the ACG field in the Azerbaijan sector of the Caspian Sea. BTC is a major project, which will avoid the Bosphorus and, thus, relieve the inevitable growth in oil-related traffic and associated environmental risks, while creating substantial revenues for the transit countries. 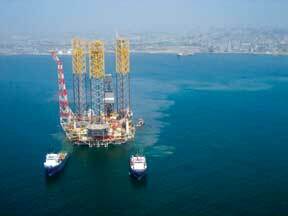 Shah Deniz spuds fourth well. The fourth appraisal well (SDX-04) planned under the Shah Deniz Production Sharing Agreement was spudded late January following the successful drilling of the fourth pre-drill well (SDA-4). The well is drilled by the Istiglal semi-submersible drilling rig. The fourth pre-drill well (SDA-4) was drilled through the Shah Deniz Stage 1 template to a total depth of 6,189 meters. The well was then logged and after the production liner run, it was suspended awaiting the installation of the TPG-500 platform later this year and subsequent completion as a gas producer. 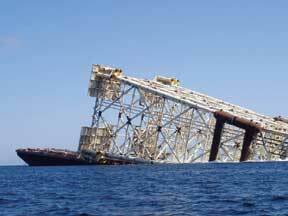 The Istiglal was moved to the SDX-04 location in the southwestern part of the Shah Deniz field on January 10, 2006. The SDX-04 well will be drilled to a total depth of more than 7000 meters. The previous three exploration and appraisal wells (SDX-01, SDX-02 and SDX-03) were designed to appraise and delineate the Stage 1 reserves in northern flank of the field. The SDX-04 well will appraise and delineate the resources in the southern flank of the field and will also test for gas presence in deeper horizons. The SDX-04 will take approximately six months to drill and production testing could extend the well's duration by several months in order to confirm the commerciality of the gas reserves in the southern extent of the field. The Stage 1 project is progressing according to schedule to meet the target of delivering first gas to the market before winter 2006. BP as operator of the Azeri-Chirag-Gunashli (ACG) and Shah Deniz Production Sharing Agreements, the Baku-Tbilisi-Ceyhan (BTC) oil export and South Caucasus Pipeline (SCP) gas export pipeline projects, has recently launched a new external Web site for all these projects. The Web site-BP.com/Caspian-will offer all interested stakeholders information on the long-term operations phase of all these BP-led projects in the Caspian Region, as well as extensive documentation on the projects' construction phase. The new site is now fully navigable in Azeri and English. This, we believe, makes the BP Caspian Web site the largest Azeri-language internet site currently available with more than 300 pages and 10,000 documents. The Web site was designed by Baku-based Jeyhun Imanov Studio. The site provides access to key project documentation such as production sharing and host government agreements, environmental and social impact assessments and action plans, as well as independent monitoring assessments, the BP Azerbaijan Sustainability Report, information on community and environmental invest-ments, career information, news, press releases, pictures and other public reporting documents. The jacket for the East Azeri (EA) production, drilling and quarters (PDQ) platform sailed away on March 11, from the Heydar Aliyev Baku Deepwater Jackets Factory (BDJF). 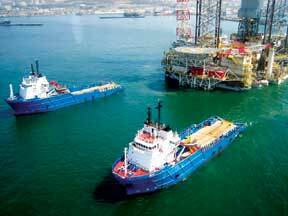 It was launched offshore onto the template at its permanent location in the Azeri field on the next day. The EA PDQ jacket was fully assembled in the country using local construction infrastructure including BDJF facilities. The total weight of the jacket is 15,000 tons. The height of the jacket is 166 meters, and it is being installed at a water depth of 152 meters. The jacket has 12 piles, with a total weight of 7,500 tons.The transportation and installation of the jacket will use a number of SOCAR/KMNF (Khazardenizneftdonanmasi) vessels including the two principal installation vessels - Derrick Barge Azerbaijan (DBA) and STB-1 launch barge. The DBA was further upgraded to undertake the installation work. The jacket transportation activities were also supported by two high capacity tugs-the Islay and the Jura. These are two identical vessels leased from the KMNF / BUE alliance fleet. The tugs were required to tow the STB-1 to the offshore site safely as the jacket's exposed windage area was very high. Other marine vessels involved in towage, anchor handling and supply boat trips were the Nercha, the Pacific Raider, and the Svetlomor-2. The installation work was expected to take 45-50 days to complete, including allowance for weather conditions.The EA topsides construction is progressing on schedule at the Baku Deepwater Jackets Factory (BDJF) yard with 93 percent of the overall work already complete. The EA topsides offshore hook up and commissioning is planned to be completed in the fourth quarter so that the platform can start-up by the end of 2006. The Phase 3 jackets that are being built at the Baku Deepwater Jackets Factory (BDJF) are designed for 175 meters of water in Deepwater Gunashli - the deepest water, in which we will have oil development operations within the ACG project. The jacket for the drilling, utilities and quarters (DUQ) platform is about 60 percent complete against the plan of 60 percent. The last jacket we have to build for Phase 3 is for the process, gas export compression, water injection and utilities platform (PCWU) and this is approximately 6 percent complete. 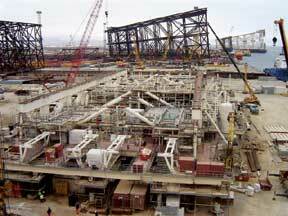 The topsides that will sit on these two jackets , one being fabricated at BDJF (DUQ) is about 37 percent complete, and the other, which is being built at the Amec - Tekfen - Azfen (ATA) yard in Bibi-Heybat, is 20 percent complete. Installation of these decks is planned for late 2007. BP as the operator of the Shah Deniz gas and condensate development project, has successfully completed the Stage 1 subsea pipelay activities, which began in September 2005. The Shah Deniz subsea pipelay program consisted of installation of three 90 km pipelines-a 26" gas pipeline and a 12" pipeline for condensate, and a 4" piggy-backed mono ethylene glycol pipeline. The pipelay program utilized the Israfil Huseynov barge which previously had been re-fit and upgraded for Azeri - Chirag - Gunashli (ACG) subsea pipelay operations. The pipeline installation contractor McDermott Caspian Contractors, Inc., expended some 700,000 man-hours on the Shah Deniz offshore pipeline installation activities. 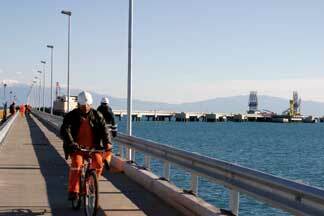 In total, the project employed up to 400 local Azerbaijani workforce. The pipe used in the pipe-lay activities was coated here in Azerbaijan. In addition, the project utilized considerable local infrastructure, including support bases, the lay barge and several support vessels. With the Shah Deniz pipe-lay now completed, the lay barge will return to complete the ACG pipeline program. To date, more than 1000km of subsea pipelines have been installed by the Israfil Huseynov, for both the ACG and Shah Deniz projects. The Azeri - Chirag - Gunashli (ACG) Project Community Investment Programme (CIP) for the Bibi-Heybat area, where construction works for the Central Azeri Compression and Water Injection Platform (C&WP) were undertaken in the ATA (Amec, Tekfen and Azfen consortium) yard was successfully completed in March. The ACG C&WP Community Investment Programme for Bibi-Heybat was launched in mid-March 2004, when a grant agreement was signed with the International Rescue Committee (IRC) for implementation of $400,000 CIP activities in Bibi-Heybat on behalf of ACG partners. The goal of the C&WP Community Investment Program was to help ensure sustainable social and economic development for the Bibi-Heybat community through multi-sector, community-based initiatives that strengthen community institutions, build leadership and technical capacity, and improve social and economic infrastructure. These have included a series of micro-projects for rehabilitation of the electricity supply system in Bibi-Heybat, construction of a health care facility and its provision with equipment, construction of a school gym, construction of a first aid station, rehabilitation of a culture centre, renovation of the Bibi Heybat secondary school, rehabilitation of the electricity system of an Internally Displaced Persons settlement, construction of a community centre, a kindergarten and a community park. The total cost of the micro-projects was 232,000 AZN (approximately $254,000), of which 27,800 AZN (approximately $30,000) was contributed by the community members with support from the local municipality and executive authorities.